Since our founding a decade ago, Suite Home Chicago has been dedicated to the well-being of our community. Suite Home Chicago, a leading corporate housing provider headquartered in the Windy City, has partnered with the national non-profit, Move For Hunger, to demonstrate their commitment to fighting hunger. Nearly 50 million Americans are affected by food insecurity, including 1 in 5 children. As a proud partner of Move For Hunger, guests at Suite Home Chicago locations have the opportunity to change these staggering statistics by donating their unopened, non-perishable food items upon departure. These year-round donations are distributed directly to local food banks in need, helping fight hunger on a broad scale in the Chicagoland area and across the United States. Through the generous support of partners like Suite Home Chicago, Move For Hunger can continue to help the nearly 50 million Americans struggling to find their next meal. For more information about Move For Hunger and how you can make a difference please visit http://www.MoveForHunger.org. Move For Hunger is a non-profit organization that mobilizes the relocation industry to fight hunger and reduce food waste. They work with companies across North America to collect unwanted, unopened food from people who are relocating and deliver it to local food banks. To date, their network has collected over 5,000,000 pounds of food. 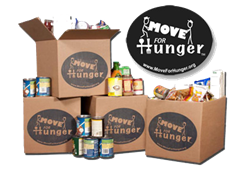 For more information or to find out how you can help support Move For Hunger, visit http://www.MoveForHunger.org. Established in 2005, Suite Home Chicago offers fully-furnished, luxury corporate apartments with flexible leasing terms throughout the Chicagoland area. The units are fully equipped with modern furnishings, high quality linens, and all the housewares needed for a temporary stay. The Suite Home Chicago staff strives to provide guests a "home away from home" experience, and are equipped to handle large corporate groups, project work, relocation, medical travel, insurance, entertainment crews, interns, and government travel. The company is a WBE-certified Woman Owned Business and a member of CHPA (Corporate Housing Providers Association.) For more information on Suite Home Chicago, please visit http://www.suitehomechicago.com, call 312.638.0891 or email sales(at)suitehomechicago(dot)com.